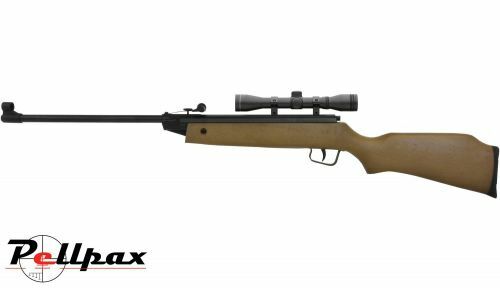 The Fox Cub from ProShot is a compact and accurate air rifle which is the perfect choice for the younger generation looking to start in the world of air rifle shooting. The Fox Cub features a robust and reliable metal action, which is cocked and loaded by the standard break barrel system. The stock is made from a high grade of Hardwood which is smoothly finished with a beech stain. The rifle has an automatic safety which is engaged each time the rifle is cocked to make this a safe rifle and teach the importance of firearms handling. In this combo you will receive the ProShot Fox Cub air rifle, topped with a 4x32 scope with mounts, all pre zeroed by our on site gunsmiths of course to get you started right away.